Kyle Wyman had a successful first weekend on the KWR Ducati at Michelin Raceway Road Atlanta. 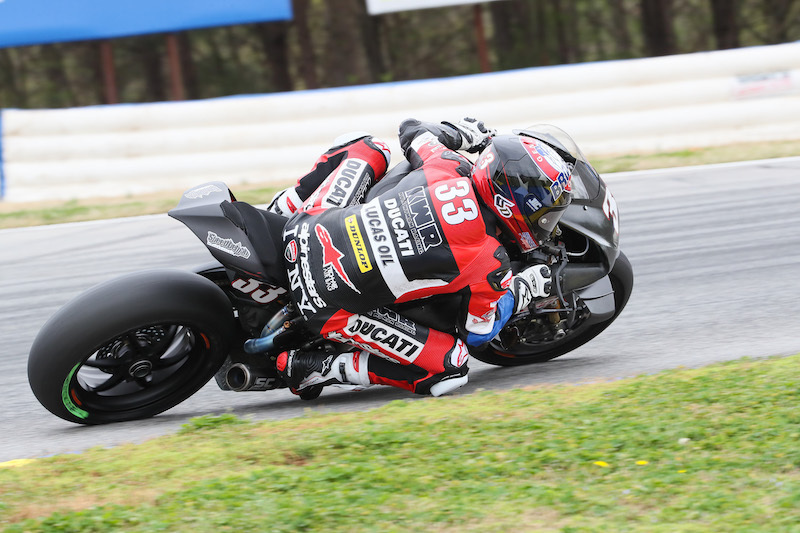 The KWR Ducati team posted impressive results this past weekend at Michelin Raceway Road Atlanta for the opening round of the 2019 MotoAmerica Superbike championship. Kyle Wyman finished 6th in race one, and posted an unfortunate DNF in race two after crashing out of 7th place on his brand-new Ducati Panigale V4 R Superbike. The weekend kicked off in QP1 with a wet-but-drying race track where Wyman posted the 9th fastest time overall. A full dry track in the afternoon allowed Wyman to finally open up the throttle fully on his Panigale V4 R. With a late-session charge in QP2, he posted the 7th quickest lap of the day which was enough to secure a spot in the Saturday morning Superpole session. The KWR team spent Saturday morning working through some chassis changes, based solely on the feedback of Wyman, while the bike is yet to have a complete data acquisition system aboard. Wyman was able to complete a Superpole time of 1:26.347 to lock in 9th place on the starting grid. For comparison, Wyman’s best time from previous years at Road Atlanta is a 1:25.330 — just over a second shy of his best on the familiar Yamaha platform. The comparison is a typical baseline to understand where the bike stacks up in stock trim. Wyman got a great start in race one, and settled into a race-long battle with former World SBK star Jake Gagne over 6th position, clearing ahead of riders but shy of the lead pack. Wyman was able to best him to the line, despite some fuel consumption issues in the closing laps. The 6th place result was a massive win for the team who would have been elated with 10th position. Race two started in similar fashion, and Wyman found himself chasing down David Anthony for 6th place once again. A late-race mistake took Wyman out of contention when he collided with a rider that was a lap down. Wyman was clipped and pushed off track, only to crash while trying to slow the bike in rain-soaked grass with only three laps remaining in the race. The next round of MotoAmerica is at Circuit of the Americas, April 12-14, 2019.